Juan Martin del Potro, of Argentina, talks with Rafael Nadal, of Spain, after Nadal retired from the match during the semifinals of the U.S. Open tennis tournament, Friday night in New York. 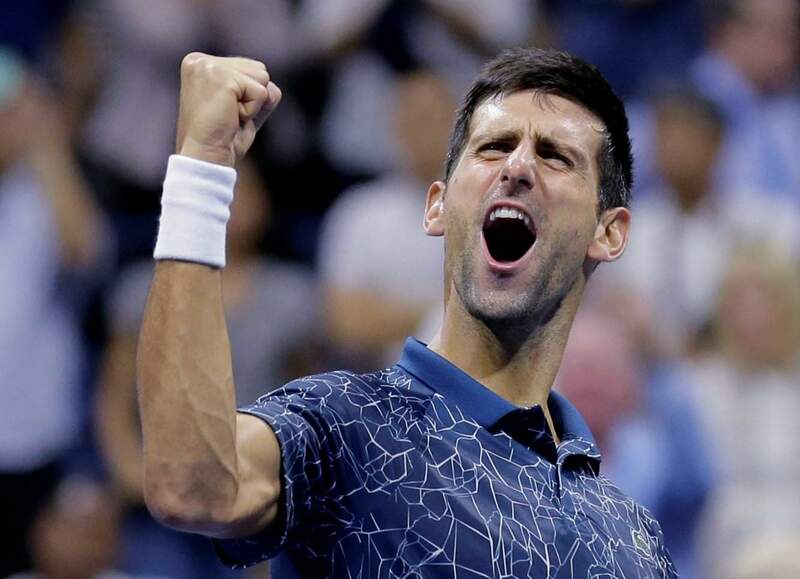 Novak Djokovic, of Serbia, celebrates after defeating Kei Nishikori, of Japan, during the semifinals of the U.S. Open tennis tournament, Friday night in New York. NEW YORK – Rafael Nadal felt the pain sear into his right knee early in his U.S. Open semifinal, on what he called “a bad movement.” It was a familiar pain, one that he’s dealt with off-and-on for years. The defending champion looked up at his guest box and indicated something was wrong. He tried to continue. Eventually, he could not. Nadal stopped playing after dropping the opening two sets Friday night, putting Juan Martin del Potro back in a Grand Slam final for the first time since winning the 2009 title at Flushing Meadows. On Sunday, No. 3 del Potro will face No. 6 Novak Djokovic, who advanced with an emphatic 6-3, 6-4, 6-2 victory over No. 21 Kei Nishikori in the second semifinal. He missed last year’s U.S. Open because of an injured right elbow, which eventually required surgery this February. But he is now back to his best, as evidenced by a Wimbledon title in July and his run in New York, where Djokovic has won his past 13 sets. 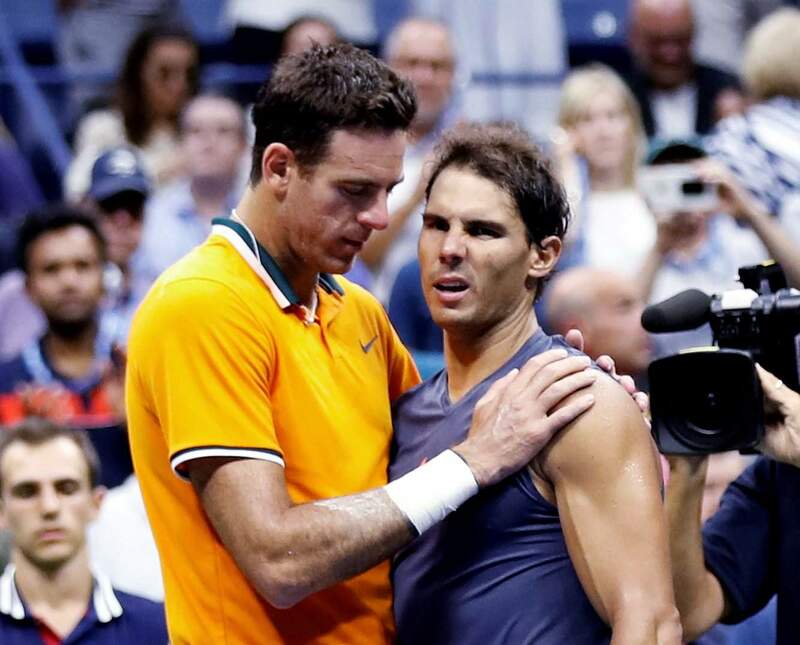 Del Potro was leading 7-6 (3), 6-2 after two hours of play when Nadal shook his head and said he had to retire, becoming the first man in the half-century professional era to do so during a semifinal or final at the U.S. Open. The No. 1-ranked Nadal has a history of tendinitis in his knees and a trainer put tape below that joint after the match’s seventh game. At the next changeover, Nadal pulled off the tape. Then, in the second set, Nadal took a medical timeout for a fresh taping. By the end, he was walking with a bit of a hitch in his gait. When he approached the chair umpire to complain about a late call from a line judge, Nadal mentioned in passing that he was going to quit. Soon enough, he did. Nadal wasn’t sure what lingering effects there might have been from his quarterfinal victory over Dominic Thiem, which lasted five sets and nearly five hours. The Spaniard, 32, did have that same knee taped during his win against Karen Khachanov in the third round. For del Potro, it was an odd way to return to an important summit. Nine years ago, he stunned Nadal in the semifinals, then Roger Federer in the final, to win the U.S. Open at age 20. He was considered a rising star, but a series of wrist operations – one on his dominant right arm, and three on his left – slowed his career and kept him out of 2½ years’ worth of major tournaments. He has returned to the height of his powers and the height of his sport. After nearly two weeks of heat in the 90s, it cooled to the 70s, although the humidity was still at about 70 percent. The lights in Arthur Ashe Stadium were on for the start of Nadal vs. del Potro, and they engaged in some terrific shotmaking during the first set. A group of about a dozen of del Potro’s friends from Argentina would salute important points won by their guy, often breaking into choruses of “Ole, ole, ole, ole, del Po, del Po!” Thousands in the crowd would lend their voices to the song; yet others would try to drown them out with support for Nadal. Those pals helped del Potro get through the toughest times, as he would need to repeatedly return to have surgery. He dealt with depression. He considered quitting his sport. As del Potro continued forehands at more than 100 mph (160 kph) and serves at more than 130 mph (210 kph), and even making hay with his much-improved two-handed backhand, Nadal offered less and less resistance. It was clear something was wrong. He barely took any time between points while serving – and he’s known as one of the slowest guys on tour. Afterward, he couldn’t say for sure how long he might be sidelined. Could be a week. Could be months. No way to know yet. All that was certain at that point was that his bid for a fourth U.S. Open title, and second in a row, was gone. As was his try for an 18th Grand Slam trophy overall as he tries to catch up to Federer’s 20. This one goes into the books as a loss, only Nadal’s fourth in 49 matches in 2018. As Nadal himself noted during a news conference that closed as he began to choke up, this was the second of those defeats that involved him quitting during a Grand Slam match because of an injury; the other was in the Australian Open quarterfinals. To be sure, del Potro knows that sort of setback, given all of his own health woes. So, too, does Djokovic.